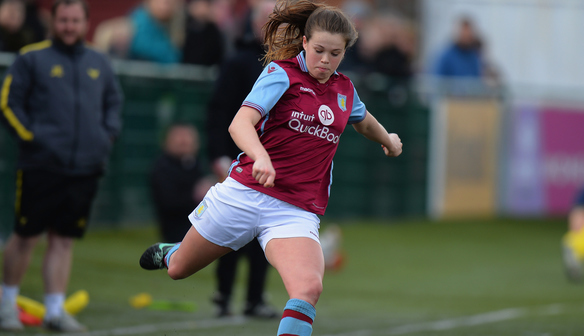 Bethan Merrick believes Aston Villa are well on track for promotion after a pair of second-half goals helped them end Durham’s 100 per cent start to the FA Women’s Super League 2 season. Merrick grabbed two assists as Katie Wilkinson’s fourth goal in five league games and a late strike from sub Mollie Rouse saw them climb to fourth in the WSL 2 table, just a point behind second-placed Yeovil. Villa were frustrated for long stretches by the brilliance of Durham goalkeeper Helen Alderson but Merrick is adamant that remaining resilient in the face of frustration paid dividends. “As the game was going on, we were getting really frustrated and Durham did a good job of frustrating us,” explained the winger. “But we kept going as we knew our chance would come eventually, we just had to stick at it. “As a winger, you’ve got to be delighted when you get an assist as that is your job. I’ve always said that an assist, to me, is more pleasing than scoring. “The aim has always been promotion and you can see this year it’s an open league that could be won by anybody. We don’t care if we finish first or second, we just want to go up. “We’ve come close but there has been a lack of a clinical edge in the last couple of years and that’s what we have been trying to work on this year to earn ourselves a WSL1 spot." Villa were on top in the first half but Alderson twice denied top scorer Wilkinson in the space of a minute while at the other end, Jess Myers produced a superb low reaction save to foil Sarah Eadon and Nicki Gears blazed wide unmarked at the far post. But Alderson was finally beaten on 67 minutes, powerless to prevent Wilkinson nodding home Merrick’s pinpoint cross and Rouse sealed Villa’s win eight minutes from time, turning in Merrick’s low pass. And while Alderson was disappointed to see Durham suffer a first WSL 2 loss following three consecutive victories to begin the campaign, she insists the Wildcats are still on course to achieve their aims this season. “We are disappointed to see our 100 per cent start to the season ended,” said the in-form stopper. “We came here and we wanted to win but we knew Aston Villa were going to be a really, really tough test. “I just think it shows how far Durham have come that we are going into every game thinking we can win and being disappointed when we don’t. But we’ll move on. “You’ve always got to look to improve and with this squad we’ve got we really want to target a top-four finish and beat our points total of last season – 20 points. Aston Villa (4-2-3-1): Jess Myers; Hayley Crackle, Elisha N’Dow, Jade Richards, Hannah George; Katy Moran, Maddy Cusack; Bethan Merrick, Kerri Welsh, Amy West; Katie Wilkinson. Substitutes: Sarah Mayling for West 59, Mollie Rouse for Welsh 59. Subs not used: Chloe Beattie, Leanne Bryant, Chloe Harper, Tash Baptiste, Destiney Toussaint. Durham (4-1-4-1): Helen Alderson; Ellie Christon, Sarah Wilson, Becky Salicki, Chloe Macek; Sarah McFadden; Jordan Atkinson, Beth Hepple, Natalie Gutteridge, Nicki Gears; Sarah Eadon. Substitutes: Mercy Darkoah for Eadon 57, Lauren Jordinson for Macek 80. Subs not used: Nicole Gibson.